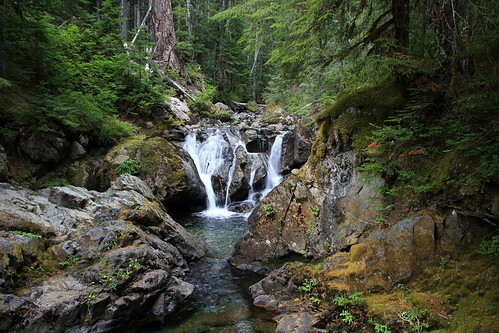 Chinook Creek, a photo by The Bacher Family on Flickr. Deep in the dark forests of Mount Rainier National Park run dozens, if not hundreds, of streams and rivers, carrying the snowmelt, glacier melt, and groundwater springs down the sides of the mountain toward Puget Sound or the Columbia River and, ultimately, the Pacific Ocean. The biggest challenge in photographing them is the "deep in the dark" part -- usually the light is pretty dim, and getting a good image requires a slow shutter speed. That means it also has to be a calm day -- if the leaves are blowing around in the wind, the whole image just turns into a blurry mess. On the other hand, a bright day is no better, because that usually fills the forest with bright spots of light that contrast dramatically with the dark shadows, and the whole image turns into a chaotic puzzle of black and white pieces. This was a perfect day: gray and calm, so that the yellow-green moss, the yellow flowers, the brown tree trunks, the green vegetation, and the green and white water of Chinook Creek all appear perfect and vivid as recorded by a tripod-mounted camera.